Speak with a certified technician today! The Most Trusted Name for Biohazard Cleanup, Crime Scene Cleanup, Unattended Death Cleanup, and Hoarding Cleanup. Since 1991 MedTech has been a trusted name in Oregon, Washington, Idaho and Montana for crime scene, trauma, and biohazard cleanup. Our trained professionals have the knowledge and expertise to help you when you need us. MedTech has staff standing by to take your call 24 hours a day 7 days a week. With MedTech help is just a phone call away 1-877-652-9984. We understand the challenges and difficulties that surround an unattended death, suicide, crime scene cleanup, bio-hazard or hoarding situation that’s why our compassionate professionals take the utmost care to provide discreet service. If you are in Spokane, Seattle, Portland, or Boise, or anywhere in the greater northwest region MedTech has certified and experienced technicians who are on call 24 hours a day just minutes away. MedTech Cleaners is a Biohazard Cleanup Company based in the Pacific Northwest specializing in bodily fluids, trauma, blood, aftermath cleaning, homicide cleanup, crime scene cleaning, unattended death, murder scenes and suicide clean up. For Over 25 years Medtech has been the most trusted name in the northwest for biohazard cleanup. Insurance pays in most cases & MedTech Cleaners waives your deductible so there’s no cost to you. When a job isn’t covered by insurance, we use a sliding scale pricing plan to determine your total cost & to figure out what plan is affordable for you. We are here to answer any questions you have about costs and insurance. Medtech has years of experience working with insurance companies. When insurance doesn't cover the bill we offer cash discounts, and payments plans. MedTech Cleaners is available to you 24/7/365. We have technicians on-call at all times, even on holiday’s. For urgent requests, call (877) 705-0372 Your feedback is important to us. 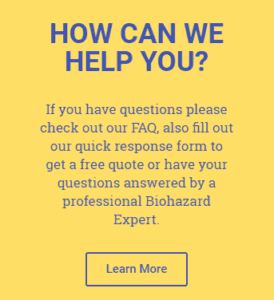 We understand that being when faced with biohazard cleanup situation can feel like a daunting task. MedTech is here to help in your time of need. "During One Of Our Toughest Family Moments They Definitely Made It Easy On Us When We Truly Needed Help." "One Of The Best In The Industry. We Have Had To Call Them For A Few Things In The Past And They Do A Good Job Everytime!" "Med Tech Cleaners is Hands Down The Best And Most Caring Cleanup Company We could ask for at a time like this. Thank you."